This is basically a burrito using a pepper instead of bread –a healthy option if you want to watch out for carbs (or if you’ve run out of tortillas like in my case, because CARBS ARE YOUR FRIENDS AND YOU SHOULDN’T BE AFRAID OF THEM).It’s the easiest thing ever to make, although it does take a long time to cook (and by a long time I mean longer than the usual 7 minutes I normally allow myself to make dinner). But you don’t have to do anything while the beans and rice are cooking, you can amuse yourself with other amenities like knitting or taxidermy as long as you remember to stir from time to time. If you’re using dried beans, make sure you soak them overnight (or during the day if you’re making this for dinner). They should be soaked for about 8 hours. Rinse the beans and cook them for 54 million years. This takes forever! If you’re using kidney beans you obviously only need to heat them up. Cook the rice in a separate pan. Take your pepper, chop off the top and scoop out the inside, so it looks like a little nice bowl. Bake the pepper for about 15 minutes, or until it gets soft (this really depends on how you like your peppers, I don't like them raw so I'd tend to bake them for longer). When the rice is ready, if you want you can add some sweet chilli sauce for flavour. If you want you can also add some cheese flavouring to the beans (this is my favourite). When the beans are also ready, it’s time to stuff your pepper. Put a layer of rice on the bottom and a layer of beans on top. Then bake the whole thing again until the pepper starts to turn brownish on the edges (again, this is up to your taste). 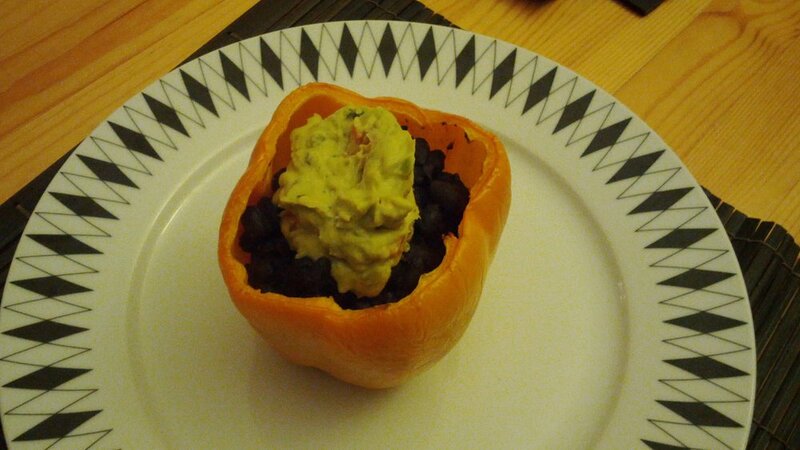 Take the pepper out of the oven, top it up with guacamole, and stuff your face in it! Also watch the video here, and for more vegan yumminess you can also follow me on Instagram :) Thanks guys!